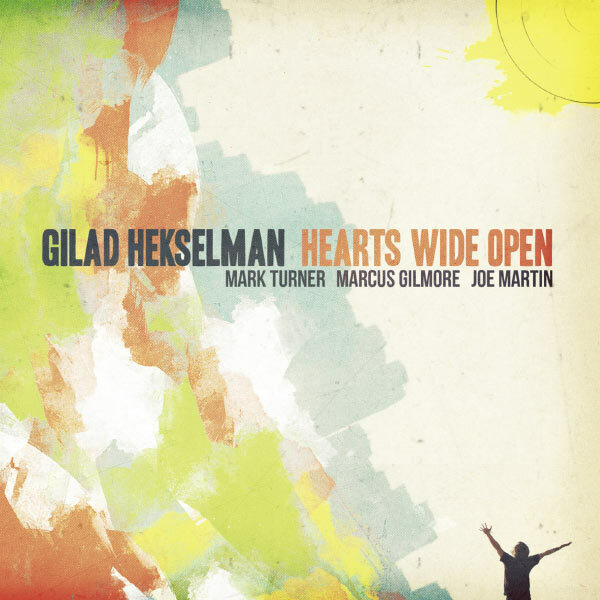 Based on his new album Hearts Wide Open, guitarist Gilad Hekselman is a player and composer to be on the constant lookout for. Joining Heksleman on this consistently engaging album are bassist Joe Martin and drummer Marcus Gilmore. Tenor saxophonist Mark Turner is featured on four of the album’s ten tracks. A very brief prologue and epilogue bookend the album, which both feature Hekselman whistling (I assume he’s whistling) a short and catchy melody played over folk-like acoustic finger-picking. The compositions, all penned by Hekselman, are very tuneful, subtle and nuanced, as is his playing. The ten minute “One More Song,” which is the album’s highlight for me, has Turner playing an extremely catchy hook at the end of each phrase. The tune is in six, but Martin and Gilmore lay it down in a way where it is not immediately obvious – not quite to the extreme way Paul Motian refused to give a downbeat on those classic Bill Evans records – but the effect of Martin and Gilmore’s approach subtly drives the band with plenty of light forward motion – the tune glides. Turner’s soloing is particularly inspired, and it’s some of my favorite playing of his I’ve heard. In general, Hekselman’s playing is measured, extremely melodic, and he holds back in a way where it makes the listener want to hear more, even on the more uptempo “Bucket Kicker” (it certainly isn’t bebop burning speed). He rarely, if at all, goes into overdrive, which is a trap less mature players can fall into, making for tired ears. “Flower” manages to be catchy and particularly subdued and gorgeous at the same time. “Understanding,” the album’s other ten minute piece is another of the disc’s highlights. It is also in six, begins as a slow and sparse ballad, but as Hekselman solos he methodically picks up the intensity, as does Gilmore, who adds a backbeat-like snare on beat four and becomes more active. When Hekselman gives way to Turner the band drops down again and slowly builds again – this double arch narrative form is extremely effective. “Will You Let It?” has a similar vibe to the Motian/Lovano/Frisell group. Hekselman plays a folk like rubato melody that floats over Gilmore’s busy drums, which are for color rather than time. Martin adds texture and depth with long held bowed notes. The group never shoots off pyrotechnics or virtuosity just for virtuosity’s sake – everything is done in service of the music and Hekselman’s vision. Hearts Wide Open is a stellar new album from an up and coming guitarist and writer who has surrounded himself with a great band who is right in line with his aesthetic and viewpoint. Definitely check this record out – it gets better with each listen.